The notorious Tasmanian devil has been listed as an endangered species this week. Surprisingly, it is not a result of human deforestation, but rather a virulent cancer epidemic in the devil population. The tumor grows quickly over the marsupials’ face and mouth. This prevents the animals from eating. The usually die from starvation or the cancer. It is in fact contagious, and is passed from animal to animal through biting. The Tasmanian devil’s population has decreased by around 60 percent. As the devil goes from being a vulnerable to an endangered species, Australia plans to pump more money into conservation to protect one of its most famous or notorious animals. More healthy animals are being placed in zoos and wildlife reserves to protect them from the spreading cancer. If the number in the wild decreases too much, these could be the replacements. The Tasmanian devil is the largest carnivorous marsupial. It is found only in Tasmania, in Australias south-eastern state. Early European settlers to the area named the feisty creature the devil for its spine-chilling screeches, dark appearance, bad temper which, and strong jaw. Before the post, I would just like to say that I broke another landmark for my blog: 300 views in one day. The United States Agricultural Secretary Ed Schafer will be traveling to a UN global foot crisis summit in Rome. There he will propose biotechnology as a strategy to boost agricultural production worldwide. At this point, the United States is contributing more than 50 percent of all the world’s food aid. Schafer says, “the world’s other developed nations have an obligation to provide food efficiently without obstructing access to it or limiting safe technologies to produce it.” To combat world hunger the US will propose a three-step plan. Naturally, many people don’t like this idea. For me, I don’t see a problem with this. Although it is a recently discovered science, it has huge potential to help people where crops are dying because of droughts, frosts, heat, disease, or insects. People have been genetically manipulating plants for ages through methods like grafting. Through biotechnology and bioengineering, scientists simply go straight for the source (the genes) and speed up the process. In honor of the new Indiana Jones movie coming out, Indiana Jones and the Kingdom of the Crystal Skulls, I decided to post about the “actual” crystal skulls, even though their historical authenticity has been all but blasted away. The legend is that the ancient Mayans or Aztecs crafted 13 crystal skulls made out of solid pieces of quartz crystal. 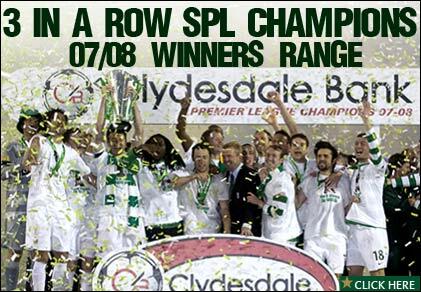 These were then scattered around the world. When the world was in grave peril, somebody would find the crystal skulls, bring them back to Central America, and save the world from destruction. A nice story, but are these skulls actually from the 500-year-old Central American civilization? Probably not. Perhaps the most famous and enigmatic skull was allegedly discovered in 1924 by Anna de Guillon Hedges. She claimed to have found it buried in a ruin in Belize. 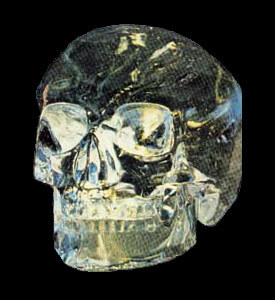 The skull was made from a block of clear quartz about the size of a small human cranium, measuring some 13 cm high, 18 cm long and 10.5 cm wide. The lower jaw is detached. Naturally, supernatural claims were made about this and all the skulls. Some believed them to be bad luck. Others thought they had healing powers. They were said to have a constant temperature at 21 degrees Celcius. Jungle animal calls were thought to be heard eminating from the skulls. Also, the original inspector of the skull said that there were no scratch marks from tools being used to craft the skull, thus some people thought that the makers had alien help. Although fake skulls were often used in Mayan and Aztec sacrificial rites, researchers who later tested the skull found it to be a fake. It was probably made in the 19th to 20th centuries with the help of rotary drills…a luxury ancient Central American societies did not have. Despite proving these skulls fake, this does not stop the crystal skull mania. Perhaps it is a desire to connect with those ancient peoples, or perhaps it is simply that people are way too gullible. Either way, the crystal skulls will remain a huge factor in our modern culture. Once again, I delved into the Encyclopedia of Life to bring you an animal for this week. It is the Pronghorn Antelope. The pronghorn antelope is the only gazelle-like creature left on North America after the split of Pangea. They live up to 10 years in the wild. They stand around a meter and a half to the shoulder, but males are bigger than females. Their wonderful horns are garnered on both genders, male and female. Their sandy coats make it very difficult to see them in the American Western grasslands. There, they feed easily on grass and other small bushes. Pronghorns are naturally very curious animals. As a result, they would inspect anything that moved, including predators. Since they are extremely fast, the second fastest land animal after cheetahs, they could escape from most of their predators. But, when humans began to hunt them, they could not outrun bullets. Thus, their own curiosity, nearly caused their extinction. Fortunately, conservation efforts have brought the populations up to a healthy level once more. Now, however, their status is once again threatened because of the destruction of their habitat by increased urban sprawl. An interesting fact about Pronghorns is that Pronghorn fawns are actually safer living around wolves. Why? Because it seems wolves will kill coyotes, the main predators of Pronghorn fawns. Thus, hunters who kill wolves for killing the Pronghorn are actually perpetuating the problem. Discovery Tuesday: Let the Project Commence. All is well on the Phoenix after its descent onto the pole of Mars. All of the instruments are working to capacity. Ever since its landing on the red planet on Sunday, the spacecraft has been filming and taking photographs of Mars’ Northern pole. 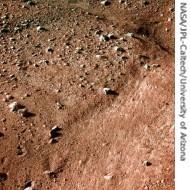 A Photo of Mars’ Icy Ground. The Polygonal Patterns are Probably Caused Due to the Ice Below the Ground. Patters Like These are Found on Earth as Well. As I already said, the Phoenix is on a three-month-long mission to dig in the soil and ice using a robotic arm. These samples will be used to find out if the conditions on Mars can hold life. The samples ought to contain organic compounds, the necessary building blocks for life. Before landing, a black and white image, aerial image of Mars was taken. This is the first time any camera has imaged a descent through an atmosphere of another planet. So far, so good. Let’s hope there are no problems and we can get answers to some of these intriguing questions. A small unmanned spacecraft built and driven by NASA named the Phoenix landed on the icy northern pole of Mars at 4:53 PDT yesterday. This is the first time that a spacecraft has landed on one of the poles. This touchdown was particularly stressful as there were no cushioned landing gear on the craft unlike the previous Spirit and Opportunity Mars rovers. The craft, pulled by Mars’ gravity, screamed through space at somewhere around 12,700 mph before it hit the atmosphere, allowing it to deploy a parachute to land safely on the ground. Thus, the Phoenix ended its 10-month, 423 million-mile flight. NASA’s scientists discovered liquid water underneath the ice of the poles in 2002. This mission was to sample the water and find out if life could be present in it. NASA attempted a landing on Mars’ southern pole in 1999, but a problem (scientific calculations of distance are done with the metric meter, not feet NASA!) during the descent ended the mission with a bang. The later Spirit and Opportunity rovers explored Mars’ equatorial region for signs of water existing in the past. The Phoenix was built from parts of smashed up polar spacecraft. Hopefully, we will finally find out if little green men (or bacterial life) can exist on Mars.